The well preserved earthwork remains of an Iron Age hillslope enclosure comprise a bank and external ditch in an irregular circle, with a possibly original entrance on the northwest side. This univallate earthwork formed by a bank with outer ditch enclosing a sub-circular area about 62 metres east to west by 50 metres transversely, some 0.3 hectares (0.75 acres) is situated about 335 metres Ordnance Datum on a gentle north facing slopes of improved pastureland between Aller/Combe, 200 metres to the east and Sweetworthy Combe about 600 metres to the west. Deciduous trees and scrub formerly covered the site quite densely but only four trees and slight scrub now remain. The stumps and hollows of cleared trees can be seen in several places but they appear to have done little overall damage. The predominantly earthen bank varies in dimensions but where best preserved in the north, it is about 9 metres in maximum width with inner scarp 0.5 metres high and outer scarp 3 metres high. Some 30 metres of the bank and ditch have been destroyed by a post medieval boundary wall (a), topped with beech trees, which cuts across the southeast arc of the enclosure. There is also a small mutilation (b) probably made for drainage, in the northnortheast. The ditch, apart from the mutilation in the southeast, is generally well preserved averaging about 7 metres in width and 1.2 metres in depth on the west and south sides, though a modern track (c) has utilised and slightly deepened the bottom of the ditch on the east side. Around the downhill northern side the ditch is practically non-existent, suggesting that the bank was the important feature. The ditch has been blocked at a later period by an earthen dam (d) being built across it in the south west. It has apparently been stone revetted on the east side and measures some 12 metres in length and is about 9.5 metres maximum width, and still stands to a maximum height of 1.7 metres. Its stone built sluice (e), 2.3 metres long 0.4 metres wide and 1 metres high internally, is still in situ set into the inner southeast face of the dam. The reservoir (f) thus formed, about 45 metres long, 9 metres wide and 1.6 metres deep, was fed by a leat (g) from the southeast and drained to the northwest below the dam where there are still slight traces of the leat (h) continuing. 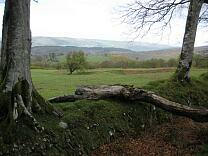 This leat is destroyed in the southeast by the post-medieval wall so the dam complex must pre-date it. From the dam a low stoney bank (i), 3 metres wide and 0.6 metres maximum height, ran along the top of the main rampart to the east for some 35 metres to 45 metres before terminating. 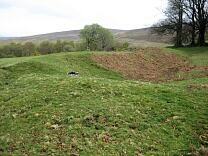 This along with probable deepening of the ditch to the south would have helped retain a greater capacity of water. <2> Page, W. (editor), 1911, The Victoria History of the County of Somerset, 521 (Monograph). SMO5358. <3> Ministry of Works, 1961, List of Ancient Monuments of England and Wales, 84 (Index). SEM7745. <4> PALMER, JP, Field Investigators Comments, Ordnance Survey visit, 24 June 1965 (Unpublished document). SMO7316. <5> Depart of Environment, 1971, Ancient Monuments of England, 12 (Report). SEM7743. <6> Burrow, I., 1981, Hillfort and Hilltop Settlement in the First to Eighth Centuries AD, 257 (Article in serial). SSO825. <7> Grinsell, L.V., 1970, The Archaeology of Exmoor: Bideford Bay to Bridgewater, 79, 85 (Monograph). SMO4578. <8> West Air Photography, 1981-1983, Oblique aerial photographs across Exmoor National Park, 27534 (Aerial photograph). SSO705. <9> Aston, M., 1983, Deserted Farmsteads on Exmoor and the Lay Subsidy of 1327 in West Somerset, 83,94 (Article in serial). SMO5560. <10> Ordnance Survey, 1978, 1:10,000 Map, 1978 (Map). SSO1446. <11> Allcroft, A.H., 1908, Earthwork of England: Prehistoric, Roman, Saxon, Danish, Norman, and Mediaeval, 137 (Monograph). SMO5064. <12> Sainsbury, I.S.S, Field Investigators Comments, RCHME Field Investigation, 15 July 1987 (Unpublished document). SMO7324. <13> Riley, H., 1996, The Prehistoric Enclosures and Medieval and Post Medieval Settlements at Bagley and Sweetworthy, Luccombe, Somerset (Report). SMO5777. <14> Various, Various, Oblique Aerial Photograph, NMR SS 8842/32 (18017/01) (19 May 1998) (Aerial photograph). SMO4069. <15> Various, Various, Oblique Aerial Photograph, NMR SS 8942/6 (15431/07) (15 May 1996) (Aerial photograph). SMO4069. <16> Various, Various, Oblique Aerial Photograph, NMR SS 8842/40 (23826/25) (19 February 2005) (Aerial photograph). SMO4069. <17> Sweetworthy/ink survey (Survey). SMO5775. <18> Sweetworthy/ink survey (Survey). SMO5434. <19> 2007-2009, Exmoor National Park NMP: SS 84 SE (Archive). SMO7568. <20> RCHME: Exmoor Pilot Survey, SS 84 SE, Somerset (Collection). SMO6274. <21> National Trust Ancient Monuments Record form (visit July 1976) (Unassigned). SSO309. <22> Historic Buildings and Monuments Commission, Field Monument Warden Report (Report). SSO1247. <23> Western Archaeological Trust, 1980s, Exmoor Aerial Photograph Survey, 8942 (Survey). SSO708. <24> 1947, LHL CPE/UK/1980, 3175 (Aerial photograph). SSO289. <25> September 19, HSL.UK.71-177 Run 89, 8668 (Aerial photograph). SSO252. <26> Somerset County Council Planning Department, Slide, 3.19.82. 03/1984 (Photograph). SSO420. <27> English Heritage, 21.11.1988, English Heritage to Somerset County Council (Unpublished document). SSO1137. <28> Preece, A., 1993-1994, English Heritage Monument Protection Programme (Report). SSO1801. <29> English Heritage, 1/8/1994, English Heritage to Somerset County Council (Unpublished document). SSO1119. <30> Haw, G, 8.2.1996, Colour print (Photograph). SSO1243. <31> 10/1/1989, DAP LD28-34, LF17-19 (Aerial photograph). SSO113. <32> Bray, L.S., 2010, Scheduled Monument Condition Assessment 2009, Exmoor National Park (Report). SEM7402. <33> Exmoor National Park Authority, 2009, Monument Management Scheme: 2008-9 Report, 12 (Report). SEM7897. <34> Gent, T. and Manning, P., 2015, Exmoor National Park Scheduled Monument Condition Survey 2015 (Report). SEM8278. SMO5358 - Monograph: Page, W. (editor). 1911. The Victoria History of the County of Somerset. Archibald Constable and Company, Limited (London). 2. 521. SEM7745 - Index: Ministry of Works. 1961. List of Ancient Monuments of England and Wales. 84. SMO7316 - Unpublished document: PALMER, JP. Field Investigators Comments. Ordnance Survey visit, 24 June 1965. SEM7743 - Report: Depart of Environment. 1971. Ancient Monuments of England. 12. SSO825 - Article in serial: Burrow, I.. 1981. Hillfort and Hilltop Settlement in the First to Eighth Centuries AD. British Archaeological Reports. 91. 257. SMO4578 - Monograph: Grinsell, L.V.. 1970. The Archaeology of Exmoor: Bideford Bay to Bridgewater. David and Charles Limited. 79, 85. SMO5560 - Article in serial: Aston, M.. 1983. Deserted Farmsteads on Exmoor and the Lay Subsidy of 1327 in West Somerset. Proceedings of the Somerset Archaeological and Natural History Society. 127. 83,94. SSO1446 - Map: Ordnance Survey. 1978. 1:10,000 Map, 1978. 1:10,000. SMO5064 - Monograph: Allcroft, A.H.. 1908. Earthwork of England: Prehistoric, Roman, Saxon, Danish, Norman, and Mediaeval. Macmillan (London). 137. SMO7324 - Unpublished document: Sainsbury, I.S.S. Field Investigators Comments. RCHME Field Investigation, 15 July 1987. SMO4069 - Aerial photograph: Various. Various. Oblique Aerial Photograph. NMR SS 8842/32 (18017/01) (19 May 1998). SMO4069 - Aerial photograph: Various. Various. Oblique Aerial Photograph. NMR SS 8942/6 (15431/07) (15 May 1996). SMO4069 - Aerial photograph: Various. Various. Oblique Aerial Photograph. NMR SS 8842/40 (23826/25) (19 February 2005). SMO5775 - Survey: Sweetworthy/ink survey . 1:1000. General: Permatrace. Pen and Ink. SMO5434 - Survey: Sweetworthy/ink survey . 1:250. General: Permatrace. Pen and Ink. SMO7568 - Archive: 2007-2009. Exmoor National Park NMP: SS 84 SE. MD002185. SSO309 - Unassigned: National Trust Ancient Monuments Record form (visit July 1976). SSO708 - Survey: Western Archaeological Trust. 1980s. Exmoor Aerial Photograph Survey. 8942. SSO289 - Aerial photograph: 1947. LHL CPE/UK/1980. 3175. SSO252 - Aerial photograph: September 19. HSL.UK.71-177 Run 89. 8668. SSO420 - Photograph: Somerset County Council Planning Department. Slide. 3.19.82. 03/1984. SSO1137 - Unpublished document: English Heritage. 21.11.1988. English Heritage to Somerset County Council. SSO1119 - Unpublished document: English Heritage. 1/8/1994. English Heritage to Somerset County Council. SSO1243 - Photograph: Haw, G. 8.2.1996. Colour print. SEM7897 - Report: Exmoor National Park Authority. 2009. 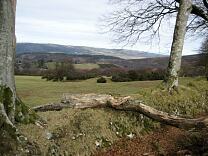 Monument Management Scheme: 2008-9 Report. 12.